Clearly, the need of the hour is Holy Ghost Revival Fire! We need the real thing – a spiritual awakening to sweep through our slumbering congregations and put us back on our knees before the living Lord. The word revival conjures up different pictures to different people. If you have lived in the South as I do, a revival means a week-long series of meetings at the church held by a powerful evangelist wearing a three-piece suit. Each of these “revival” meetings is primarily designed to reach unbelievers for Christ. I personally have been on the evangelistic field preach revival services for over 31 years and we have witnessed thousands of people surrender their heart and life to Christ. That is all tremendous, however, that’s not what revival is. Evangelism is not revival. That’s regeneration. Revival is strengthening believers in the church. Reaching the unsaved is the by-product of revival. Revival is a sovereign work of God in His own people, bringing back to full spiritual fervor the hearts of believers that are now dormant and dull. Revival is a visitation of God that brings to life believers who have been sleeping and restores a deep sense of God’s near presence and holiness. All this ushers in a sense of sin and a profound exercise of heart in repentance, praise, and love with an evangelistic overflow. Charles Finney, the revivalist of the early nineteenth century, defined revival as “a new beginning of obedience.” Simply put, it is a new humility. A new closeness to God. A new passion for Christ. A new love for God. A new desire for holiness. A fresh new baptism in the Holy Ghost! That’s what real revival is! It is a sovereign and mysterious work of God, just as the new birth is. It cannot be coerced, nor manipulated. It is a supernatural work of God in His church that restores her lost purity, devotion, and power. Revival restores to full health the spiritual life that is already present in the church. It is the renewing, purifying, replenishing work of the Holy Spirit in the life of the church. Realistically, revival is a time of divine visitation. It is an invasion from heaven that manifests the presence and power of God in the church. It ushers in a renewed, conscious awareness of God’s awesome holiness that produces holiness in the church. Now, that’s the real thing!!! That church, the church of Sardis, was dead as last years Christmas tree! They had lost their spiritual passion and fervency for Christ. They were flat and devoid of spiritual power. By outward appearances, they looked religious and sounded pious. But in reality, they were dead. Jesus called out to them to wake up! That’s what revival is – it is a spiritual awakening of those who are lethargic toward Christ. It is a sleeping church – unconscious, unresponsive, unexcited – waking up to the presence of God and returning to full spiritual vitality. It’s waking up to Jesus Christ and allowing Him to strengthen what spiritual life remains. How can we wake up? How can we have revival in the church and in our lives? How can we stop playing church and have the real thing? Revival begins with the ministry of the Word of God. It begins with the preaching of the Word of God to the church under the anointing of the Holy Ghost! Why is that so important? Because the Scriptures are full of the life of God (! Peter 1:23; John 6:63). And if we are to have God’s life within the church revived, then God’s Word – which is “living” and “active” (Hebrews 4:12) – must invade our lives. Like produces like. The Word of God revives the life of God in His people. In fact, each of the seven letters to the seven churches in the book of Revelation begin with a call for the proclamation of God’s Word: “To the angel of the church in Ephesus write…” (Revelation 2:1), “To the angel of the church in Smyrna write…” (2:8), “To the angel of the church in Pergamum write…” (2:12), “To the angel of the church in Thyatira write…” (2:18), “To the angel of the church in Sardis write…” (3:1), “To the angel of the church in Philadelphia write…” (3:7), and finally, “To the angel of the church in Laodicea write…” (3:14). Notice that the emphasis is on the communication and proclamation of the written Word of God! In each passage the pastor of the church is told to communicate the written Word of Christ to His congregation. That’s where revival begins. It begins when the pastor and the spiritual leadership of the church preach and teach the Word of God. I love what D.L. Moody said, “The best way to start a revival is to build a fire in the pulpit.” The Lord Jesus Christ promises to bring a great spiritual awakening to the church where God’s Word is preached. John wrote in Revelation 1:3, “Blessed is he who reads and those who hear the words of the prophecy, and heed the things which are written in it.” This verse pictures the public gathering, or worship service, of the church. The Word of God is to be read by the pastor (“he who reads”). And is to be heard and obeyed by the entire church (“those who hear…and heed the things which are written in it”). It is the Word of God – preached, heard, applied, and obeyed – that brings Revival Fire to the hearts of God’s people. That’s exactly what Psalm 119 tells us. Revival comes when the Word of God invades our lives, searches our hearts, and produces holiness. The psalmist says, “Revive me according to Thy word” (verse 25). He pleaded, “Revival me in Thy ways” (verse 37). “Thy ways” is a synonym for the Word of God because it points out the way we are to take. Again he says, “Revive me through Thy righteousness” (verse 40). “Thy righteousness” is another synonym for God’s Word because it defines right and wrong. Also, “I will never forget Thy precepts, for by them Thou hast revived me” (verse 93). Finally, “Revive me according to Thy word” (verse 154). Each of the seven letters to the seven churches in the book of Revelation finishes up in the same way: “He who has an ear, let him hear what the Spirit says to the churches” (Revelation 2:7, 11, 17, 29; 3:6, 13, 22). Revival breaks out when God’s Word is preached, heard and, by the power of the Holy Ghost, illuminates and convicts, and is applied to our lives! If there is to be a revival in our churches, it must begin in our pulpits! Pastors and Evangelists must return to bold, biblical preaching of holy Scripture (2 Timothy 3:16-4:5). Many things today have been offered to replace biblical preaching. Some of them – musicals, Christian talk shows, movies, and drama – have a place in the church. But they should never be allowed to replace the preaching of the Word of God. The need of the hour is for the powerful, Holy Ghost anointed preaching of the Word of God! Think about this, God only had one son, and He made Him a preacher (Mark 1:14). If we are to have revival, we must return again to biblical preaching that exalts Christ, exposes sin, encourages hope, builds faith, and calls for a verdict. It is the proclamation of the Word of God that prepares the way for revival! I want to encourage and challenge my fellow pastors and evangelists…PREACH THE WORD!!! Cuba’s churches may still be restricted, but that’s not stopping a spiritual Revival Fire in the communist nation. The churches in Cuba are thriving right now. All of them are growing, not just in the number of members but in their capacity to lead and act in society. The Cuban government is now allowing Revival Fires to distribute the brand new Cuban Spanish Truth for Youth Bible to the 1.4 million young people of Cuba that have never had a Bible! The Cuban government is also allowing churches to provide the social services that it once monopolized. These projects include AIDS prevention, sustainable agriculture, renewable energy, medicine distribution and disaster relief. It is estimated that about 25,000 evangelical and other Protestant houses of worship are flourishing across the country. Assemblies of God churches have seen the most spectacular growth in recent years. In the early 1990’s they had roughly 10,000 members compared to 120,000 currently. Some 100,000 Cubans consider themselves Baptist and 40,000 are Methodist. Sixty percent of Cuba’s 11 million people are baptized Catholic. For many years the Cuban government has not allowed churches or other religious groups to build houses of worship or other structures. This has inadvertently sparked the growth of house churches which Cuban believers have multiplied with great success. However, recently, because of a close connection with Pastor Hernandez Salazar in Havana, Cuba, Revival Fires has been granted permission to help build large facilities for the purpose of proclaiming the Gospel of Jesus Christ all over the country of Cuba! Pastor Salazar has great favor with the Cuban government officials as he previously served as the National Cuban Council of Churches president from 2008 to 2012. While serving in the position, he was able to regularly plant the seed of the Gospel into the hearts of then Dictator Fidel Castro, Fidel’s brother, Raul Castro, and many other high-ranking Cuban government officials. Pastor Salazar now oversees more than 250 on fire for God churches that are making an eternal, spiritual impact in the entire nation of Cuba! We have already helped Pastor Salazar build a church in Santa Clara and a church in Cein Fuegos. We are now in the process of helping to build two more churches in areas of Cuba where there are no churches. It cost our ministry only $10,000 to build one church building. If the Holy Spirit lays on your heart to help us with the expense of providing the necessary funds for these churches or to help us provide Bibles for the people of Cuba that have never had a Bible you may use the enclosed envelope. Wrap your gift with love and please pray for the people of Cuba! Across the country, we have experienced, and are currently experiencing, miraculous moves of God. Currently, revival fires are sweeping across America in our revival services! We are witnessing a massive amount of healings and miracles of deliverance, supernatural breakthrough and salvation. The Holy Spirit is flowing mightily in the lives of each person in attendance. I see these miracles as a sign that an even greater awakening is on the horizon! The personal, regional, and global expansion of God’s kingdom through His manifest presence are what we are seeing take place right now. The focus on revival fire has brought many to Christ and led to countless testimonies. Healing a range of afflictions, from scoliosis to manic-depressive disorder, God is working miracles in the lives of those attending our revival services. We are seeing more miracles happen by accident than we ever used to have on purpose. When the glory of God begins to come into the room, I’m not going to stop that to preach. I don’t have anything that important to say. The preaching of the Word of God under the anointing of the Holy Ghost is extremely important, however, to me, it’s all about His presence. 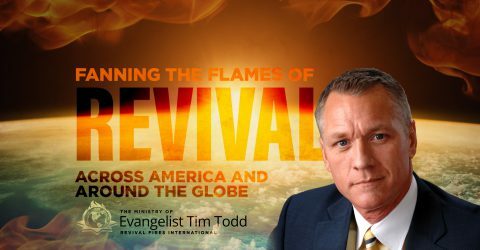 Please pray with us as we continue to fan the flames of Revival Fires across America and around the world! !